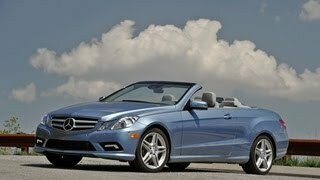 The all new Mercedes-Benz E-Class Cabriolet is the latest addition to the successful E-Class line-up. 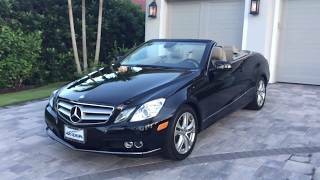 The open-top two-door model, which goes on sale in May 2010, features a classic fabric soft top, making for a stylistically pure cabriolet feeling. Viewed from the side, the new model is an intriguing proposition – with its clear proportions and a flawless cabriolet silhouette. The all new E-Class Cabriolet is the latest addition to the successful Mercedes-Benz E-Class line-up. The open-top two-door model, which goes on sale in May 2010, features a classic fabric soft top, making for a stylistically pure cabriolet feeling. Viewed from the side, the new model is an intriguing proposition – with its clear proportions and a flawless cabriolet silhouette. In keeping with the motto "four seasons, four personalities", all-year-round suitability was right at the top of the developers' list of priorities. 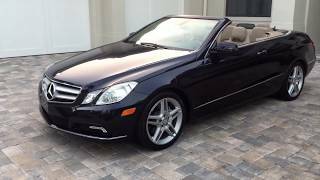 With the new E‑Class Cabriolet, the cabriolet season lasts the whole year because, while many cabriolets tend to disappear from the roads in the Fall, the Mercedes-Benz E-Class Cabriolet (length/width/height: 185.0/70.3/55.2in.) provides driving pleasure and comfort whether the roof is open or closed. The soft top can be opened and closed fully automatically within 20 seconds – even when driving at speeds of up to 25mph. The cabriolet roof is stowed in a special compartment behind the rear panel. A retractable cover separates the soft top compartment from the trunk area; it must be closed in order to close the soft top. If the roof is to remain closed, the cover can be slid rearwards, in which case the trunk capacity is increased by 3.17 cu. ft. to 13.8 cu. ft. A through-loading feature is included as standard for the new Cabriolet, as is EASY-ENTRY – a manually operated entry and exit aid for the rear passengers. The power plants for the new E-Class Cabriolet are equally innovative: the engines combine efficiency with effortlessly superior power delivery. The exemplary, low fuel consumption has been achieved because of a number of practical measures. These include on-demand activation of the steering and fuel pumps, the use of tires with low rolling resistance and an alternator control system which takes account of the current driving situation and the vehicle's electrical power requirements, plus the crucial factor of outstanding aerodynamics. The Cabriolet's cd figure of 0.28 is the best in its class, marking a continuation of the E-Class success story in the field of aerodynamics. In 1989, Mercedes-Benz introduced a world premiere in the shape of a draught-stop for the SL model series, followed in 2004 by the AIRSCARF® neck-level heating system to further enhance comfort in open-top models. Now comes another world-first: the AIRCAP® automatic draft-stop, which can be activated at the push of a button, greatly reduces turbulence in the interior of the new Mercedes E-Class Cabriolet, creating a sea of warm air. It is also much easier to implement and use than conventional draft-stops: there is no tricky installation, the two individual rear seats remain free and the Cabriolet's flowing side lines remain uninterrupted. AIRCAP® is therefore a classic Mercedes innovation: functional, comfort-enhancing, elegant and safe. As well as enhancing occupant comfort and wellbeing, the reduction in draft when AIRCAP® is activated (it can be activated at speeds of up to 100 mph and remains in use right up to the car's top speed) reduces the interior noise level – so passengers in all seats find it far easier to communicate. When the standard AIRCAP® is combined with the optional AIRSCARF®, the system functions like an invisible scarf warming the occupants' head and neck areas. AIRSCARF® is integrated into the backrests of the front seats and provides warm air through outlets in the head restraints. Mercedes engineers have modified this unique innovation specifically for the E-Class Cabriolet: in this model, an adjustment wheel pivots the outlet nozzle upwards and downwards by a total of 36 degrees over and above the head restraint height adjustment, meaning that the driver and front passenger can enjoy the unique neck-level heating regardless of how short or tall they are. Thanks to its sound-dampening soft top, fitted as standard, even the closed E-Class Cabriolet has one of the quietest interiors in the segment for four-seater premium cabriolets with a fabric roof. The soft top's exceptionally high-quality insulation brings about a clearly noticeable reduction in the interior noise level compared to conventional fabric soft tops. Exterior noise caused by other vehicles and wind noise are therefore absorbed more effectively. On the road, the difference is audible from speeds of just 50 mph, for example when driving through a tunnel or overtaking a convoy of trucks. At higher speeds, the benefits of the acoustic soft top are even more tangible. For instance, it is possible to have a perfectly normal phone conversation in hands-free mode even when travelling at a speed more than 125 mph. The soft top is of course waterproof and windproof. Plus it can be put through an automatic carwash without any hesitation. With a total thickness of .9 inches, the fabric soft top offers excellent thermal insulation, meaning that the E-Class Cabriolet is also ideal for use in winter. 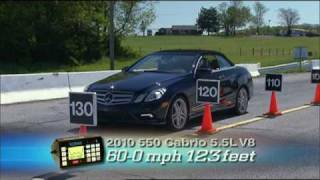 The new Cabriolet offers the wealth of safety innovations one would expect from a Mercedes-Benz model. Highlights of the open-top two-door model include roll-over protection, the A-pillars reinforced by two additional tubes and the plug-in B-pillars. This new model is also the first Mercedes cabriolet to feature headbags. The roll-over protection consists of two robust bars, each with a diameter of 1.4 inches, which are housed in the rear head restraints in modules behind the rear seat backrests. A tilting cone sensor detects imminent danger to the occupants based on extreme skidding movements or acceleration caused by impact. If this sensor then sends a corresponding signal, pre-tensioned pressure springs are activated by pyrotechnic means, i.e. extremely quickly. The plug-in B-pillars are extremely robustly connected as they engage in the side skirts, thus offering highly effective protection in the event of a crash. A shoe made from ultra-high-strength steel braces the inside of the B-pillar against the rear seat crossmember. With seven airbags fitted as standard, belt tensioners and belt force limiters for all seats, not to mention crash-responsive head restraints for the driver and front passenger, the new E-Class Cabriolet offers the most extensive safety equipment package in this vehicle category. The airbags, which can deploy in milliseconds in the event of an accident, include front airbags and sidebags for the driver and front passenger, a kneebag on the driver's side, and headbags. The latter, which appear in a Mercedes cabriolet for the first time, are housed in the door panelling in the beltline area. Covering a wide area – around 2.3 x 1.6 feet with a volume of 17 liters when deployed – the airbags provide extremely effective protection for occupants large and small in the event of a crash. The three-part side protection system – comprising headbag and thoraxbag – optimises the level of protection afforded to individual parts of the body. Rear sidebags are available as an option. Further exemplary safety equipment available for the E-Class Cabriolet includes ATTENTION ASSIST drowsiness detection, PRE-SAFE® anticipatory occupant protection, Adaptive Highbeam Assist, and DISTRONIC PLUS proximity control.